Whenever people ask me “How do you like living in Holland?” part of my answer has to do with travel. You see, living in the Netherlands means I can travel to other European countries very easily. In fact, I can drive into Germany in about a half hour. Belgium is about two or three hours away. In seven hours I can reach Paris. It never ceases to amaze me, though, this hop to another country. That half-hour drive into Germany takes me to a place that looks pretty much exactly like here – flat-as-a-pancake farmland – yet isn’t at all like here. People speak German, of course, rather than Dutch. And they have an entirely different culture: different foods, different ways of celebrating holidays, a different school system, different traditions. One of many Christmas Markets in Germany; this is Oldenburg. In the background, the rathaus (city hall). On the right, the St. Lamberti church looms behind the brightly-lit stalls. Europeans take this ease of travel for granted. I don’t. Even after more than 19 years in the Netherlands, I get a thrill just crossing a border. At the same time, lots of Dutch people take advantage of being so near to other countries. They spend summer vacations in warm places like the south of France or the coast of Spain. In the winter, they ski in the Austrian, French or Swiss Alps. 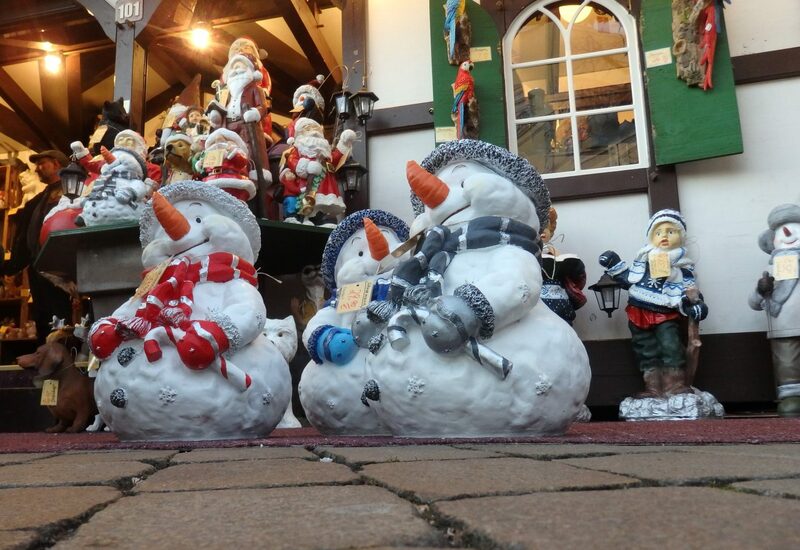 In the lead-up to Christmas, they visit Germany for the Christmas markets. Germany is near enough that, for many of us, it’s just a day trip. My friend Kate and I went last weekend to the Christmas market in Oldenburg, less than two hours from my home in Groningen. It’s a small city, so the market is small. If you went to Köln, for example, or Munich or Berlin, you’d get many more stalls to explore. It’s funny: most countries in Europe have Christmas markets of some sort. Yet Europeans travel to visit the ones in Germany. 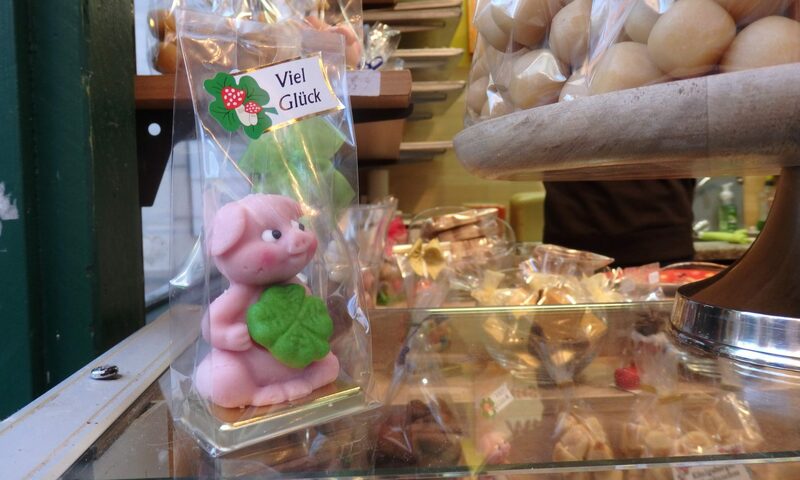 So what makes German Christmas markets so special? The Christmas market stalls twinkle with lights and color, especially when it gets dark: mid-afternoon this time of year. In most cities the market is in the center of town, often ringed by charming historic buildings. In Oldenburg, the lovely St. Lamberti church sits in the middle of all the market activities. 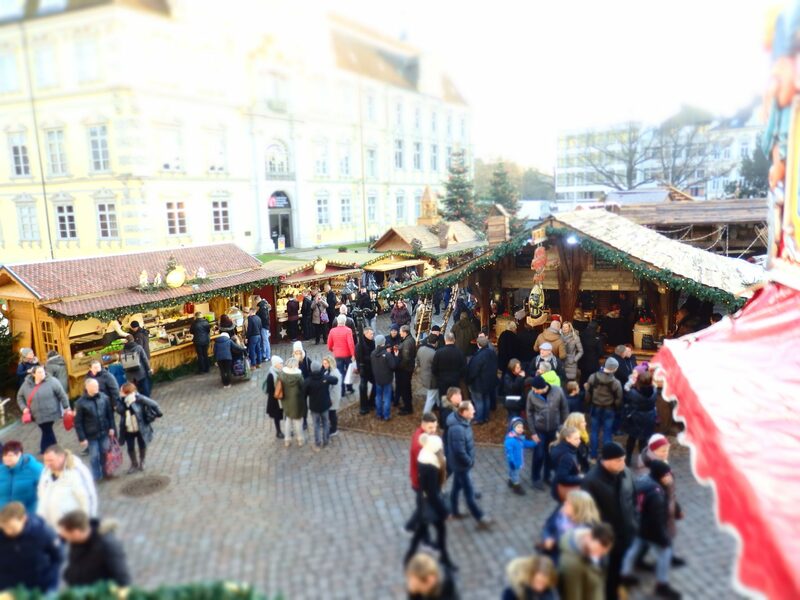 The Lamberti Market square, on one side, is filled with Christmas market stalls. On the other side, the stalls and childrens’ attractions extend to Schlossplatz, which faces the Oldenburger Schloss (castle). A beautiful 16th-17th century building, it was once the home of the Dukes, Grand Dukes and Earls of Oldenburg. Now it’s a museum of art and cultural history. A few of the market stalls with the Oldenburger castle as backdrop. Notice the people drinking glühwein at the nearest stall. Everyone at the Christmas market is in a good mood. Even the people working in the stalls are friendly and smiling, despite the cold. (I suspect many have space heaters hidden under the displays.) Children drag parents along, over-excited by the lights and colors. And the visitors are happy to be there, drinking in the Christmassy atmosphere. Another thing they drink is glühwein. Quite a few of the stalls are essentially outdoor bars. Glühwein is the traditional drink at German Christmas markets. It is a heated, sweet, spiced wine, available in white or red. You’ll be charged extra for the mug (two euros this year in Oldenburg), which you can get back if you return the mug. If you like it, keep it. The same goes for hot chocolate, served in the same mugs with whipped cream on top. Either way – glühwein or hot chocolate – a hot drink may be necessary depending on the weather. You’ll be outside wandering the market for hours, and your hands need warming! A bit of a warning about the drinking: as evening progresses, the crowds get louder and drunker, but they stay cheerful. Don’t be surprised if your drink gets jostled and spilled. Most years I leave before it gets too cheerful. Germans do heavy comfort food really well. This visit, we enjoyed a hot roast pork sandwich, with pork cut from the rotisserie as it turned, served with mayonnaise and sautéed onions. Kate’s had sauerkraut as well. It was delicious. Later we tried a dampfnudel. We felt we had to try it because dampfnudeln were featured on this year’s Great British Bake-Off, and they’re hard to bake. That’s mostly because they aren’t baked, but steamed. It’s more like steamed bread than cake, but has a sweet fruit filling. 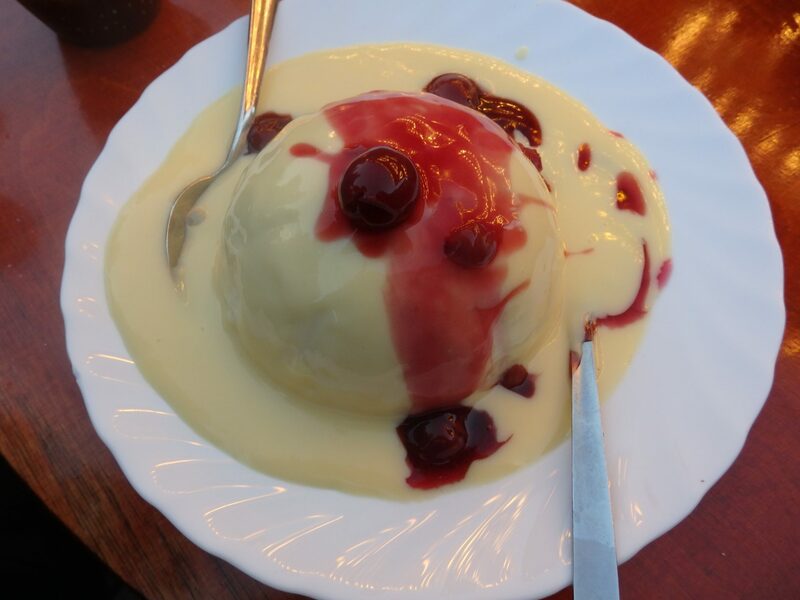 Then it’s topped with vanilla sauce and fruit sauce: in our case, cherries. We bought one and shared it. Much larger than the ones featured on the BBC, it was so filling it spoiled any chance of eating dinner at the market. You’ll find plenty of other food choices, though. One stall specializes in mushrooms, while another serves crepes and another serves poffertjes (a small, sweet, Dutch pancake). The emphasis, though, is on meat, and you’ll find lots of different takes on meat dishes, predominantly pork. While many of the stalls sell food or drink, the rest stock all sorts of items, often handcrafted. You can buy candles and crystal and artisanal candy and woodwork and winter hats and mittens. And it’s all prettily displayed, lit by strings of Christmas lights. The proprietors are not at all pushy, so feel free to browse. Or you can buy silly Christmas snowmen! German Christmas markets are very child friendly, at least before the drinking takes off. At this little market in Oldenburg, we went on the small Ferris wheel (and got some amused smiles when people in line realized we were without kids). We also saw a merry-go-round, a storytelling booth (presumably only in German), and pony rides. Candy stalls around every corner provide plenty to bribe your kids with so you can enjoy your glühwein. Buy them a candy apple and it will keep them happy and busy long enough for a drink. The German version of Santa Claus (who, this year, looked just like Santa Claus) meets and talks to the kids one by one, just like in the US. However, if your kid doesn’t speak German, you might risk encountering a Santa Claus who doesn’t speak English. For those of a religious bent, you can find actual Christmas in Christmas markets as well. There’s always a nativity stall, sometimes even with live animals. And, because the markets are often next to a church on a central market square, you can attend a service or hear traditional music being performed. Christmas markets in Germany always include a nativity scene like this one in Oldenburg. So add this to the things I like about Holland: visiting Christmas markets in Germany. Does your hometown do a Christmas market? What’s it like? Add your blog to the linkup, using the link below. Put a link back to this page onto your blog post. Visit at least a few of the other blogs in the linkup, comment on them, share them and enjoy them! 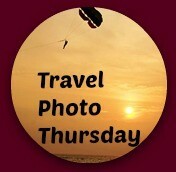 If you don’t have a travel blog yourself, you can still click on any of the blogs below and visit them! I have so much to comment about your post! Travel will be one of the reasons I would love to live in Europe. During my latest travels there, I met a couple from the Czech Republic which have visited every country in Europe. To them, it is nothing out of the ordinary but I was amazed. And the thing is that this wasn’t even that difficult to accomplish. I’ve visited a lot of Europe too, though some of Eastern Europe (i.e.Poland) I’ve only driven through and not really seen. And some of it I saw back in the 80s and don’t remember much of. We’re planning to head east next summer, so I’ll make up some of that! I’ve never been much of a fan of pork, but somehow at a Christmas market roast pork just seems right. As an Australian I am so totally envious of people like yourself who live in Europe. If I lived there I would be like you and never take it for granted. It costs us so much money to get to Europe! I’m pretty sure I would be buying some winter hats and mittens at the Christmas Market. On the other hand, you can fly to Asian countries much more easily and cheaply than we can! I am at this very moment wearing some sheepskin slippers I bought at a Christmas market last year. 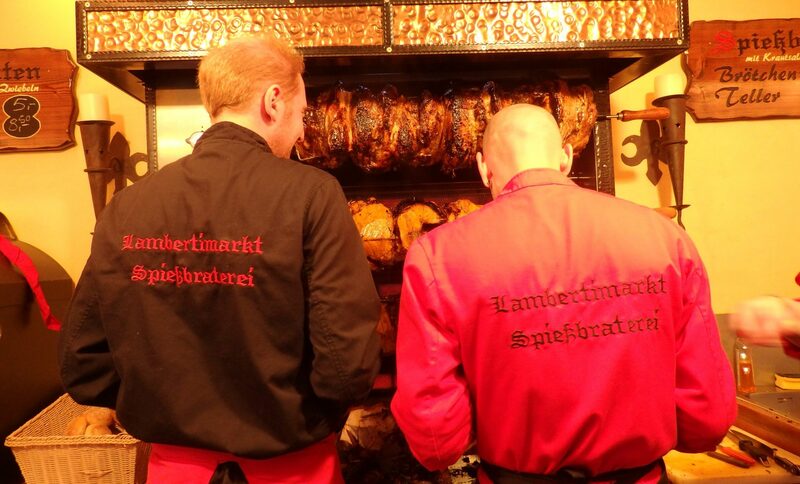 The food at the Oldenburg Christmas market looks superb! Well, I wouldn’t call any of it haute cuisine, but eating is half the fun! Wow! 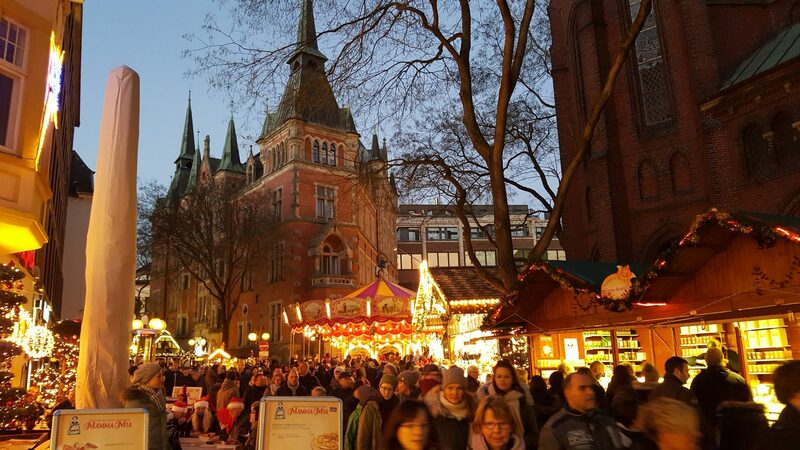 I had no idea about Germany’s Christmas markets! 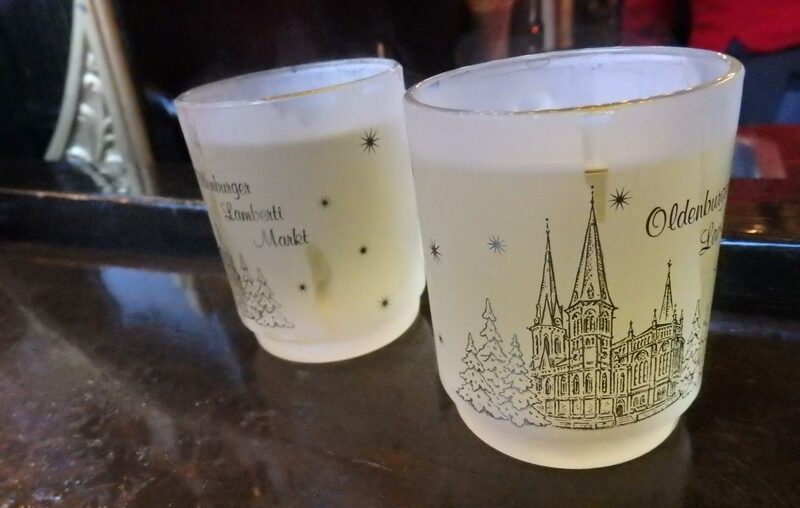 I minored in German in university, and I got to try gluehwein.  I’m finally going to make it to Germany for the first time in February. I’ll have to make sure I’m in Germany some time for Christmas season so I can have a Christmas market experience. You might still be able to find gluhwein in the supermarket after Christmas. Just warm it up, but not too much! Well, if you eat dampfnudel, don’t expect to eat much else! ‘Living in Berlin. It certainly does! I adore the German Christmas Markets, they’re just such a great way to hang out with your friends of an evening! I hosted an American blogger just yesterday, and she wanted to visit as many Xmas Markets as possible! I managed to show her in just one evening – Four Christmas Markets, the medieval quarter – Nikolaiviertel, a bit of the Berlin Wall, a German celebrity Red Carpet event, and two famous currywurst Berlin venues, in both East & West Berlin! Wow, that sounds exhausting! Unfortunately Berlin is a bit far away for a day trip for me, but some year I’ll get there for Christmas! I’ve always wanted to go to the Christmas markets in Germany, I was actually supposed to go a couple weeks ago but had a change of plans sadly! These photos are great! Hopefully i can make it in 2017!